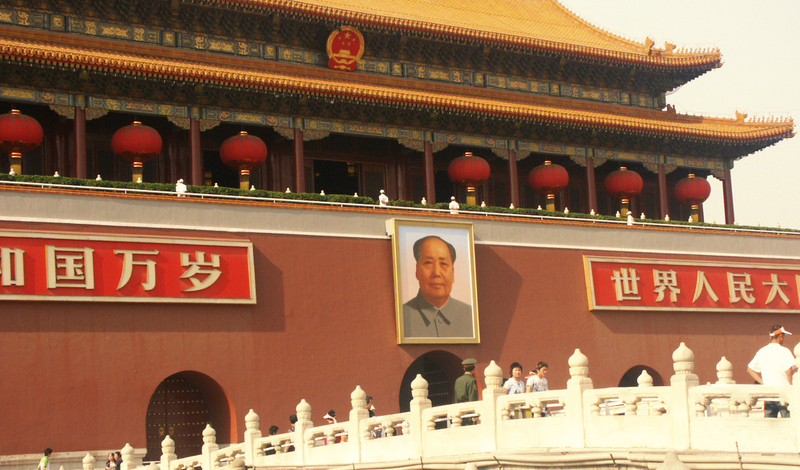 Chairman Mao casts his watchful eyes over everyone entering the Forbidden City through the main gates in Tiananmen Square, Beijing China. The name “Zijin Cheng” is a name with significance on many levels. Zi, or “Purple”, refers to the North Star, which in ancient China was called the Ziwei Star, and in traditional Chinese astrology was the abode of the Celestial Emperor. The surrounding celestial region, the Ziwei Enclosure (Chinese: 紫微垣; pinyin: Zǐwēiyuán), was the realm of the Celestial Emperor and his family. The Forbidden City, as the residence of the terrestrial emperor, was its earthly counterpart. Jin, or “Forbidden”, referred to the fact that no-one could enter or leave the palace without the emperor’s permission. Cheng means a walled city. Today, the site is most commonly known in Chinese as Gùgōng (故宫), which means the “Former Palace”.The museum which is based in these buildings is known as the “Palace Museum” (Chinese: 故宫博物院; pinyin: Gùgōng Bówùyùan). From 1420 to 1644, the Forbidden City was the seat of the Ming Dynasty. In April 1644, it was captured by rebel forces led by Li Zicheng, who proclaimed himself emperor of the Shun Dynasty. He soon fled before the combined armies of former Ming general Wu Sangui and Manchu forces, setting fire to parts of the Forbidden City in the process.By October, the Manchus had achieved supremacy in northern China, and a ceremony was held at the Forbidden City to proclaim the young Shunzhi Emperor as ruler of all China under the Qing Dynasty.The Qing rulers changed the names on some of the principal buildings, to emphasise “Harmony” rather than “Supremacy”,made the name plates bilingual (Chinese and Manchu),and introduced Shamanist elements to the palace. After being the home of 24 emperors – 14 of the Ming Dynasty and 10 of the Qing Dynasty – the Forbidden City ceased being the political centre of China in 1912 with the abdication of Puyi, the last Emperor of China. Under an agreement with the new Republic of China government, Puyi remained in the Inner Court, while the Outer Court was given over to public use,until he was evicted after a coup in 1924.The Palace Museum was then established in the Forbidden City in 1925.In 1933, the Japanese invasion of China forced the evacuation of the national treasures in the Forbidden City. Part of the collection was returned at the end of World War II,but the other part was evacuated to Taiwan in 1947 under orders by Chiang Kai-shek, whose Kuomintang was losing the Chinese Civil War. This relatively small but high quality collection was kept in storage until 1965, when it again became public, as the core of the National Palace Museum in Taipei. After the establishment of the People’s Republic of China in 1949, some damage was done to the Forbidden City as the country was swept up in revolutionary zeal.During the Cultural Revolution, however, further destruction was prevented when Premier Zhou Enlai sent an army battalion to guard the city. The Forbidden City was declared a World Heritage Site in 1987 by UNESCO as the “Imperial Palace of the Ming and Qing Dynasties”,due to its significant place in the development of Chinese architecture and culture. It is currently administered by the Palace Museum, which is carrying out a sixteen-year restoration project to repair and restore all buildings in the Forbidden City to their pre-1912 state. In recent years, the presence of commercial enterprises in the Forbidden City has become controversial.A Starbucks store that opened in 2000 sparked objections and eventually closed on July 13, 2007.Chinese media also took notice of a pair of souvenir shops that refused to admit Chinese citizens in order to price-gouge foreign customers in 2006. Thank you Mark, for those who have yet to visit it’s an encouragement to do so and also fascinating background….. more pictures as well, please!